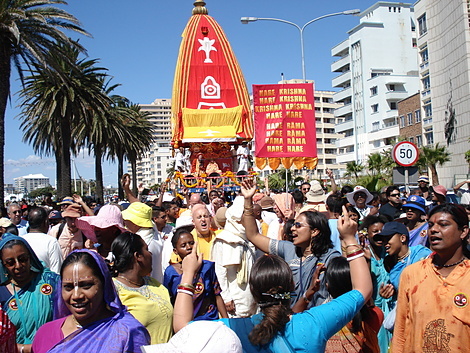 Rathayatra is the International Society for Krishna Consciousness’ biggest street festival – it features three huge, wooden chariots pulled by hand accompanied by; Singing, chanting, drums, cymbals and dancing. The procession ends with a stage show, festival and delicious vegetarian prasadam feast. As the story goes, Lord Krishna once overheard a conversation about how His dearest devotees, the cowherd maidens of Vrindavana, were lamenting in His absence. When He heard these accounts of overwhelming love in separation, the Lord’s hair began to stand on end, His eyes opened wide and filled with tears, and His arms and legs contracted as He went into a state of spiritual ecstasy. Seeing Lord Krishna in this condition, His elder brother, Balarama (Baladeva), also began to feel ecstatic symptoms and displayed similar features. When Their sister, Subhadra, arrived at the scene, she too became consumed with ecstatic joy. Thus the sublime deity forms of Jagannatha, Subhadra, and Baladeva represent this sweet pastime. Five hundred years ago, Lord Chaitanya Mahaprabhu, the combined incarnation of Radha-Krishna, encouraged all of His followers to celebrate Ratha-yatra with great enthusiasm. His biographies (such as Chaitanya Charitamrita) list many anecdotes surrounding the Ratha-yatra festival. It is said that Chaitanya Mahaprabhu got down on His hands and knees to scrub the Gundicha temple where Lord Jagannatha would stay at the end of the Ratha-yatra parade. Srila Prabhupada, the founder of the Hare Krishna movement, was very fond of Ratha-yatra. As a child he began celebrating Ratha-yatra when he was five years old, using a small home-made cart and pulling it around the neighborhood with his friends. Later in life, from 1967 until his passing, Srila Prabhupada joined thousands of disciples in cities around the world as they celebrated elaborate Ratha-yatra chariot festivals in the streets of London, Paris, Sydney, Tokyo, San Francisco, Los Angeles, and on New York’s prestigious Fifth Avenue. 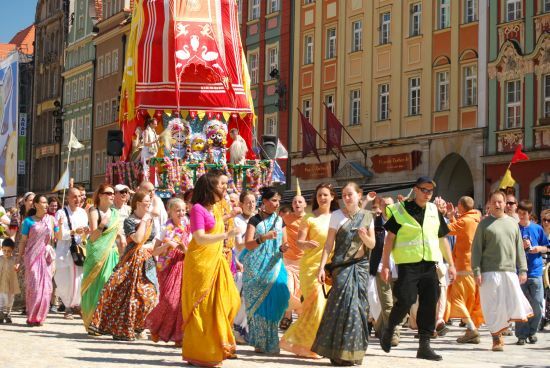 Today, Hare Krishna devotees hold Ratha-yatra parades in many cities, usually culminating in a “Festival of India” set up in a city park, with festival tents, entertainment stages, free-feast booths, and a variety of cultural displays and exhibits. Contact your nearest Hare Krishna temple to find out about Ratha-yatras in your area. Ratha-yatra signifies the Lord’s love for His devotees. He personally comes to visit His devotees and the public who welcome Him in the streets. Befitting the sentiment of its origins, Ratha-yatras in the Hare Krishna movement also serve as reunions for devotees who come from far and wide to participate, meeting up with old friends around their common goal of serving Lord Jagannatha, Sri Krishna.